This Professional Tote has all the pockets and compartments needed - whether you are looking for a handy baby bag, or just a professional tote, this tote has it all. There is a pleated pocket on each side of the tote to hold a bottle of water, umbrella, magazine, baby bottle or telephone. Also, on the front is a zippered pocket to hold your ID and Passport for your airport travel. Behind that pocket is one for your boarding pass. On the backside is one large pocket for a newspaper. On the inside, there is a large center dividing zippered pocket that holds file folders. There is plenty of room inside for a laptop computer. Several pockets are inside for your business cards, keys, pens, PDA, and more. To finish it off, there is a zipper that will close tight to keep the contents secure. 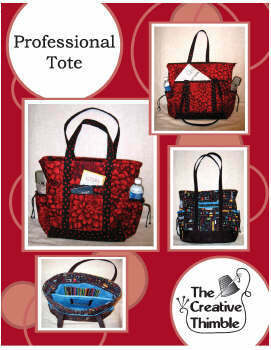 This would also work great as a sewing tote with a place for patterns or books, fabrics and notions. Let's not forget about the "professional" diaper bag, with a pocket for all the babies' needs.